Mornings are moody here in LA of late. I can’t think of much more apropos to compliment the first-thing fuzz and cuppa joe than Portland’s Luz Elena Mendoza and her band, Y La Bamba. We recorded this session live at Jackpot Studios in Portland, just before Thanksgiving in 2009. The song is Juniper, from Y La Bamba’s debut album, Lupon (produced by The Decemberists’ Chris Funk;Tender Loving Empire). 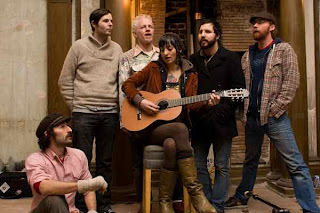 Y La Bamba has upcoming shows in Seattle, Vancouver, Nevada City and Portland. Click here for dates to catch them live.